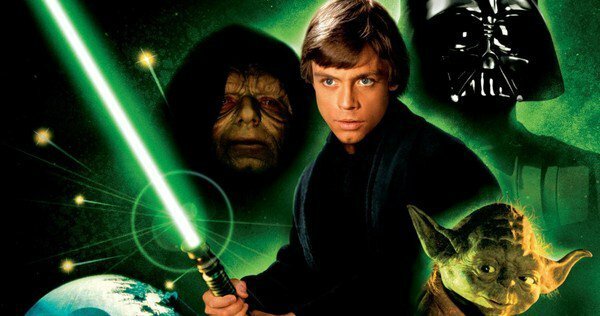 Why is Luke’s lightsaber green in Star Wars: Return of the Jedi and not blue, like it was in The Empire Strikes Back? It’s a question that’s plagued fans for years now and the most popular answer seems to be that the color of the weapon is tied to the character’s personality. After all, the blue lightsaber wasn’t Luke’s to begin with, it was Anakin’s. As such, when the young Skywalker finally got one to call his own, it made sense that it’d be a bit different than his previous one, right? Well, not quite. In Vanity Fair’s extensive Star Wars: The Last Jedi cover story, which was published this week and sent the internet into a collective tailspin, Lucasfilm Story Group creative executive Pablo Hidalgo shed some light on Luke’s lightsaber. According to him, it was actually supposed to be blue, like his father’s, but due to some production troubles, it had to be changed. Yes, that’s all it came down to, production troubles. Nothing to do with his personality or how strong the Force was with him, as some would have you believe. Hidalgo recalls that while filming Return of the Jedi, the scene in which Luke saves Han from Jabba the Hutt was shot in Tunisia and the blue lightsaber was blending in with the bright blue sky. George Lucas and his team eventually realized that it wasn’t going to pop out enough and so, they went with green instead. “The intent was the lightsaber was going to be blue. In that universe, at that time, as far as anyone knew, lightsabers were red or they were blue. As much as we like to mythologize why it’s green and what that all signifies, sometimes there are very pragmatic filmmaking reasons behind these things,” says Hidalgo. As it turns out, the reason for Sammy J’s Mace Windu getting a purple lightsaber was also a similar story. Like Luke, it didn’t have anything to do with the character and was simply made that way because the actor requested it. Why? So audiences could pick out Mace in the various fight scenes in Attack of the Clones. “George [Lucas]’s rule of thumb was bad guys get red, good guys get blue, or, eventually, green. Lo and behold a purple one came into existence,” said Hidalgo. While some fans may be disappointed that there’s no deeper meaning behind the different colored lightsabers seen in the franchise, this is still a fun bit of trivia and will, at the very least, put the speculation to rest. This also isn’t the first time that Hidalgo has shared the real reason behind the green lightsaber, as he Tweeted about it a few years back, though not many people seemed to take notice and the fan theories have continued to persist. Now that we know the story behind it though, the next question is whether or not we’ll get to see Luke wield it in Star Wars: The Last Jedi. Hidalgo wouldn’t give a firm answer on that, instead saying, “we’re not ones to lose track of lightsabers.” Could the weapon make a return then in Rian Johnson’s upcoming film? It certainly sounds possible, but we’ll have to wait and see.